You have worked and tweaked and finally created the perfect shape for your character. You have either dialed pre-packaged morphs, or customized the shape in a 3rd party application and imported the shape. The character is sitting on your screen in DAZ Studio and look great! At this point, any work you have done creating your morph will be lost if you close DAZ Studio or start a new scene, without first saving the Morph Asset. This can be done in any of the following three ways outlined in the steps below. Follow the one that best fits your workflow. This tutorial required DAZ Studio 4.6.3.52 or higher. Keep in mind the different scenarios and and things to consider before saving the Morph. Ask yourself a few questions. Are you simply tweaking an existing morph? Will you be sharing or distributing a custom morph? Is this something you changed for a specific scene only? Do you need to continue working on the morph at a later time? The answers to these questions will help you decide which step below is best for the situation. If you are not ready to save the Morph out as a deliverable Asset, save your Scene. This will embed the morph and you can open it up again at a later time and continue your work. This also works if you have tweaked a morph for a specific scene and are not planning to reuse or share it. There are two things to consider when saving out a morph. Is it completely custom? This means you took the base, non-morphed figure and sculpted it in a modeling application and manipulated it into the desired shape. Does it contain any shape properties from any other package? If you dialed anything before exporting the figure object, you will need to use “Reverse Deformation” to reverse out the dialed morphs. This will ensure the new “character morph” simply references any dialed morphs instead of embedding them. For a completely custom character morph you have designed from scratch in a modeler, you can simply save the Morph Asset as described in Saving Your Morphs as a Morph Asset . If your custom morph changes the rigging, such as scale or bone placement, you will need to skip down to Saving Your Morphs by Creating a new Property, below. If you used any morphs from any other morph package, or those included with the base figure, you will need to follow all the steps below to ensure you are reversing out any non-custom morphs. By carefully following the steps below, when saving your characters, you can avoid illegally using another person's morphs in your character packages. If you use any morphs created by someone else, even if you change and customize them further, you must package your product as described below. These steps will show you how to use “Reverse Deformation”, which will then require the customer to own the original morph package. Your morph will simply reference the other person's morphs. Embedding someone else's morphs, even if you change them further, is in violation of the EULA. The first step is to create a new property for your shape. This creates a slider in the appropriate group so you, or a customer, can manually add your new shape to their character. By creating the slider, the new shape can be mixed with other shapes. 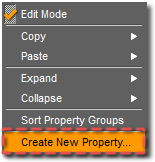 Edit Mode - First you need to make sure you are able to edit properties. Do this by R-clicking in the Properties Pane and click on Edit mode. You will get a window with the settings for your new property. Most things you can leave as they are. There are a few you will want to change. Path - This is the area you want your new property slider to show up. Actor/Full Body/ is normally when you are saving Head and Body properties separately. If you were to try your new slider now, you would notice that nothing happens. Let's run ERC Freeze. Asset Directory - This is normally already filled out with a path. Check and make sure it is appropriate. Vendor Name - Your vendor name if you have one. Product Name - The name of the product you are creating. Properties - Select which Assets should be saved out, by placing a check in the box next to each of the desired assets. You can save out a Character Preset for your custom or dialed character. This allows the customer to simply click an icon in their Library, instead of hunting down a shaping dial. Material Settings - Check this if you want the character to load with a particular texture set. You should now be able to go to your library and find your preset in the location you chose. It will save with a screenshot of the DAZ Studio viewport. You can create a custom icon for your preset if you choose. Now that you have saved your morph, you can reuse, share it or package it for sale.